Before Manifest Destiny, when Americans poured into California in the early 1800s--trappers, explorers, backwoodsmen, whalers, and merchants who stumbled into the area prior to the 1848 annexation of the area by the United States and the unprecedented migration of the 1849 gold rush--the "Californios" ruled the state of Upper California. 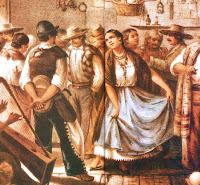 A few of the gente de razón or upper class Californios were descendants of Spanish soldiers sent up from Mexico and spoke the pure Castilian language. There was an aristocracy, the ones of straight Spanish blood with clear brunette complexions who never intermarried with natives. The least drop of Spanish blood was sufficient to raise one from the rank of slave, entitle the wearing of fancy clothing, and the right hold property. These gente de razón were all pretty much related to each other. From the upper class down, a regular gradation was indicated by skin color, growing darker until reaching the hue and features of the pure Indian. Even the commoners, to American ears, they appeared to speak elegant Spanish. A messenger on horseback spoke like an ambassador. They had no credit system, no banking, no way of earning money other than the cattle raised on their enormous ranchos, employing elegant vaqueros whose skills at horsemanship were unsurpassed in the continent. They had no money except for hides, which sailors called "California bank notes." If going any distance no matter how short they mounted a horse. Few could read or write. They were inveterate gamblers and drunkenness was so common it was rare to meet one without his bottle. Like Indians, they made women do all the work, and even in management of stock and the lasso it was not uncommon to find women more skillful than men. The big amusements, not surprisingly, were large fandangos held at each other's ranchos that got pretty wild and lasted for days. They also enjoyed horse racing (risking hundreds of cattle upon the speed of the horse), bull- and bear-baiting, and Monte gambling. They gambled with a passion but paid their losses punctually and with little concern. Monte games were conducted with great decorum by American standards--the loud swearing and other "turbulent demonstrations" of losers only came from "foreigners." While Californios bore their losses with indifference, Americans raised the roof down. They were given enormous land grants by Mexico. The greatest Californio of all, General Mariano Vallejo, owned Rancho Petaluma: 67,000 acres of what is now the entire "wine country" of the Sonoma valley. 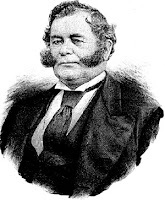 During the 1846 Bear Flag Revolt, a few enterprising (some said addled) Americans took over Vallejo's rancho in Sonoma in a bloodless coup, arrested him, and sent him to Sutter's Fort, although Vallejo himself was a proponent of annexation by the United States. Little by little, as Americans encroached and California became one of the United States, these huge ranchos were whittled away by squatters, sale, or the 1862 Homestead Act that parceled the land out to American settlers. Californios are idle thriftless people, and can make nothing for themselves. The country abounds in grapes, yet they buy bad wine made in Boston and bought round by us at an immense price...They buy shoes from us (and like as not made of their own hides, which have been carried twice round Cape Horn) at fifteen dollars apiece. Things sell on an average at nearly three hundred percent upon Boston prices. Yet up until the time the Mexican regime ceased, Californios had a custom of never charging for anything--entertainment, food, or use of horses. Travelers brought their own blankets and knives, and could always count on receiving a plate of beef and beans at any rancho, giving the hostess back her plate with a "Muchas gracias, señora," to which the hostess would have replied, "Buen provecho": May it do you much good.